Are you an origami aficionado? Well, then I bet you will be enthralled by the book Origami Master Class Flowers. And just to get you started, you can Download the full tutorial on how to make an origami narcissus. Make a few (you'll have to practice anyway) and make this beautiful paper floral arrangement to brighten up a side table or shelf. Origami Master Class: Flowers is an expert-level course in folding breathtakingly beautiful origami flowers. Arranged by designer, this book offers you step-by-step instructions to make 12 of the most complex flower models ever designed. Master diagrammer Marcio Noguchi will guide you through creating advanced origami flowers with clear and precise diagrams that allow even beginners to fold these extraordinary projects. This book also contains exclusive content, including Robert Lang's "Rose," one of his most complex and sought after pieces, which has never before been diagramed. Inside, you'll also find beautiful and inspiring craft projects to use your folded flowers for, as well as biographies of the six artists who are among origami's most distinguished designers. As promised, today I have a tutorial on how to fold an origami twisted rose from the book Origami 365: Includes 365 Sheets of Origami Paper for A Year of Folding Fun!. 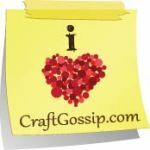 And if you would like to get yourself in the running for a copy of Origami 365, pop on back to Monday's Craftside post andenter to win Origami 365, Boycraft and a whole bunch of Horizon Group craft supplies. I made a whole bunch of the origami flowers and simply taped them onto this curled wire decoration. The papers in this kit are so pretty I couldn't stop! Origami 365: Includes 365 Sheets of Origami Paper for A Year of Folding Fun! With 365 sheets of paper and projects, this book will take you on a yearlong adventure of learning Origami. A Japanese past time, Origami is the art of folding paper. Author Taro Yaguchi grew up in Japan and developed a love for paper from his grandfather’s job in a Japanese paper plant. This love sparked an interest in learning to fold and eventually teaching others the art. Packed with folding projects for both experts and beginners, it is perfect for artists of any age. Step-by-step instructions will help guide you into making ornate projects that can be used as decorations or gifts. These projects include creating paper cranes, flowers and animals. Origami 365 will have you folding simple yet sophisticated projects all year. Taro Yaguchi’s love for paper developed as a child growing up in Japan. The monthly flights between the U.S. and Japan became his meditative space. “How can I share the joy of origami culture with millions of people around the globe? How can I make it more accessible for everyone?” Soon, he came up with the idea of uniquely pre-printed sheets of graphic origami. He initially created and copyrighted the graphic origami of a commercial aircraft, trucks, cars and other modes of transportation. Since then, his origami books were published and collaborations with corporations such as TOYOTA took place. We all give gifts and cards to others; why not make your own cute origami envelope out of wrapping paper? This origami envelope tutorial from the book The Origami Artist's Bible would be cute for a card or cd that you want to match the gift wrap with the envelope. Click on these pages from The Origami Artist's Bible to enlarge and follow the tutorial on how to fold an origami envelope. This hardcover book with internal wire-o binding is 6.5in x 8in, a perfect size for readers to keep handy and reference often. The stylish design of this book, along with the interior photographs, illustrations and diagrams, make the learning process simple and fun for origami beginners and provides useful tips for more advanced folders. Origami transcends gender, culture, and language. It demands no prior learning and no complex equipment; it can be done at any age, by anyone; models can be large or small, useful or ornamental. You can fold a bus ticket or a sheet of gold leaf, but the sole requirement of becoming an expert in origami is that you enjoy it! The Origami Artist's Bible starts with a simple set of origami folds, illustrated with clear step-by-step diagrams, and three essential origami "bases" that are starting points for project models in the rest of the book. The models are arranged according to theme; some are complex, requiring patience and practice, and some are suitable for total beginners. Today, I have a great origami pattern for a placecard from the book The Origami Artist's Bible that you can use for all the upcoming holidays to decorate your table so that your guests know where to sit. I bet it would be great to also use to label food items so your guests know just what scrumptious goodies await them. Click on these pages from The Origami Artist's Bible to enlarge and read the full step-by-step tutorial on how to fold an origami placecard. Today, we're back to Halloween with 2 giveaways and a decoration. 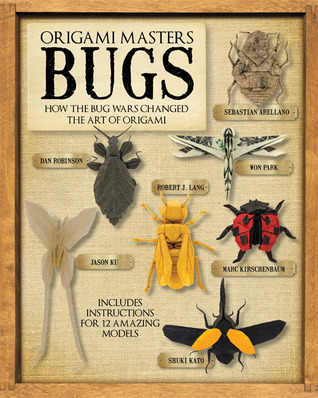 You can get yourself in the running for copies of Origami Masters: Bugs How the Bug Wars Changed the Art of Origami and 20 Ways to Draw a Cat and 44 Other Awesome Animals. So if you want to fold up some spooky bugs and draw some black cats you will be all set! If you are in the mood to make some felt skulls to hang about, here is how I made a bunch. Using the skull template below, I cut out the outline, the eyes and nose. Then I traced the skull onto the felt, and cut them out. After that, I simply used a sharpie to draw in the teeth and some of the texture lines freehand. I hung them up on a string of Christmas lights with tiny clothes pins along with a spider and a bat made from black garland. I used Styrofoam balls for the eyes on the spider. I used little ping pong balls for the eyes on the bat. This is the skull outline I used to make my felt skull garland. Giveaway ends October 17, 2013. This inspiring sketchbook is part of the new 20 Ways series from Quarry Books, designed to offer artists, designers, and doodlers a fun and sophisticated collection of illustration exercises. 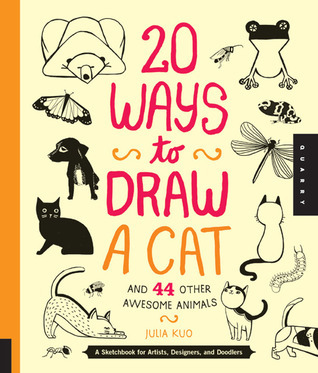 Each spread features 20 inspiring illustrations of a single animal, such as a cat, giraffe, seal, elephant, or whale–with blank space for you to draw your take on 20 Ways to Draw a Cat. The stylized animals are simplified, modernized, and reduced to the most basic elements, showing how simple abstract shapes and forms meld to create the building blocks of any item that you want to draw. Each of the 20 interpretations provides a different, interesting approach to drawing a single item. Presented in the author’s uniquely creative style, this engaging and motivational practice book provides a new take on the world of sketching, doodling, and designing. Julia Kuo splits her time between Cleveland, OH, and Taipei, Taiwan. She grew up in Los Angeles, CA, and attended Washington University in St. Louis for illustration and marketing. Julia illustrates children's books, concert posters and CD covers, designs stationery and journals, and paints in her free time. One recent gallery show featured paintings of street fashion shots from Face Hunter. Julia's clients include American Greetings, the New York Times, the Home Shopping Network, Little Brown and Co., Capitol Records, Tiny Prints, and Universal Music Group. Her illustrations have been honored in American Illustration, CMYK magazine, and Creative Quarterly. Visit her online at http://www.juliakuo.com. In the early 1990s, members of the Origami Tanteidan Convention in Japan began a unique competition devoted to insects and other arthropods as, over a period of years, artists attempted to one-up each other, successively adding legs, antennae, wings, and more. Each year, the models became increasingly complex, as origami enthusiasts from around the world joined the fray. Beetles became winged beetles. Winged beetles became winged spotted beetles. And so on. Models went from 30 or 40 steps to hundreds of steps. As a result, origami artists developed a range of design techniques that ultimately changed the entire art of origami folding. Bugs continue today to be a favorite subject for origami artists, and this book both describes the original challenges that stretched the art and also includes 12 original contemporary bugs (including one master-level project) designed by some of the most talented origami artists today from around the world—with detailed step-by-step instructions to make them.